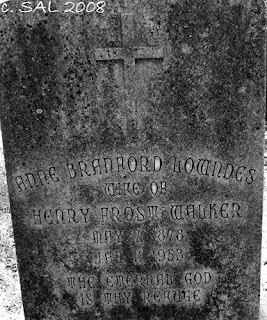 Anne Branford Lowndes Walker died on this date 56 years ago. She was born 7 May 1878 and later married Henry Frost Walker. Anne was buried in St. Philip's Church Cemetery; Charleston, South Carolina. Henry Lee Perdue died on this date 33 years ago. He was born 5 April 1927. Henry was buried in Bonaire Cemetery; Houston County, Georgia. Lillie Tyner Nowell died on this date 17 years ago. She was born 25 December 1886. Lillie was buried in Sardis Cemetery; Bibb County, Georgia.